The Isle Of Man was quite a busy tourist destination in the pre-War years, but I have only recently discovered a handful of walking pictures from the island. These were taken by the firm of S.R. Keig, based at the Allan Bank Photo Works on Circular Road, not too far from the promenade at Douglas, the island’s largest town. Keig’s is a photography business with a long history going back to the 1860s when they were taking studio portraits from 8 Prospect Hill in Douglas under the name T. Keig. The firm also photographed scenic images of the island for sale, and postcards for the tourist market. They also produced Carte de Visites for many years (one of the backs is shown above), both studio portraits and photos of friends in flat painted rowing boats in the studio. Around 1911 the firm began photographing the TT Racers, and several volumes of these images were published as books in the 1970s, going right up to the 1960s. Keig’s opened a studio at Strand Street in more recent years, doing wedding photography, and still run by the same family until it closed after 2010. The Keig archive was bought by a local publisher who are planning to scan the 20,000 plus surviving negatives. 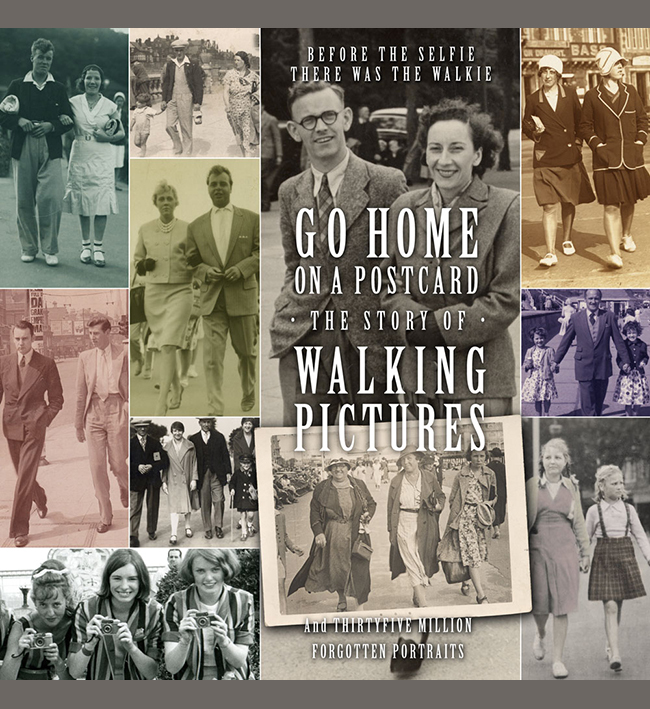 It seems unlikely any of the walking pictures survived as they were not thought to be worth saving. Indeed Keig’s walking picture business has every indication of being short lived. The four cards I have found are all very similar in style and format, and the hand numbering seems to run consecutively (the highest number I have is 5945). They were all taken in the smaller town of Port Erin rather than Douglas. The two above were taken on the promenade above the bay, outside the large Eagle Hotel which can be seen in the vintage photo below (this was really kicked about in later years and rebuilt as flats, as you can see from the current street view at the bottom of the page). The walkie below was taken on the same road. It helps that this card is dated 1937 on the negative and I suspect they were all taken within a year or two of that date. All the walkies, which are postcard size, are well taken, have a nice atmosphere and look quite spontaneous. It is possible Keig’s gave up the trade with the outbreak of WW2 and never returned to it. If anyone can add to the story please get in touch. How to ruin your town, before and after!